Australia Post is a government owned postal service corporation in Australia. They offer a range of postal and logistics services to domestic and international destinations. With the help of ELEX Australia Post plugin, you will be able to integrate Australia Post shipping services to your WooCommerce store cart and checkout pages. The plugin helps you display Australia Post shipping services and their live rates on the frontend of your WooCommerce store. It also helps you print eParcel labels for contract customers along with packing items into boxes. 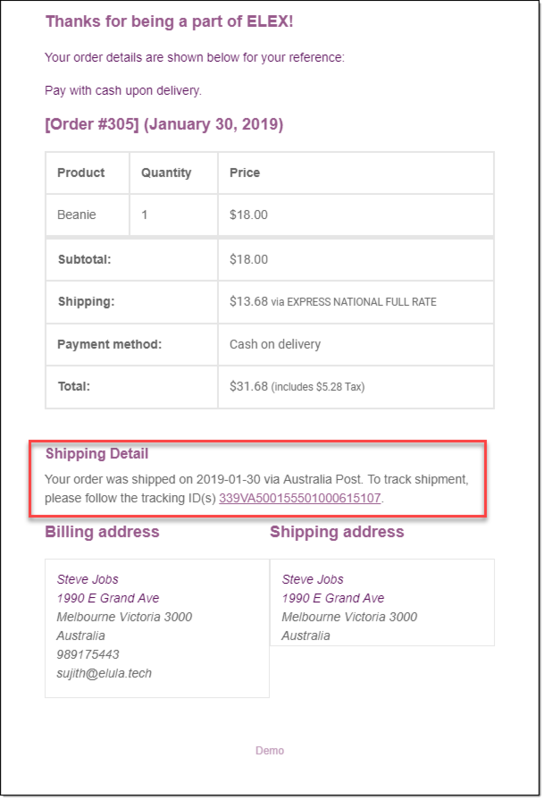 In this article, we will discuss how you will be able to provide WooCommerce shipment tracking using Australia Post shipping plugin to your customers. When you generate a shipping label using the plugin, you will find that a tracking code is generated as well. This tracking code will help you track the shipment in transit till it reaches the customer. After you receive an order on your store, you can go to the order details page and generate a shipping label. The tracking code will be automatically generated at this point. 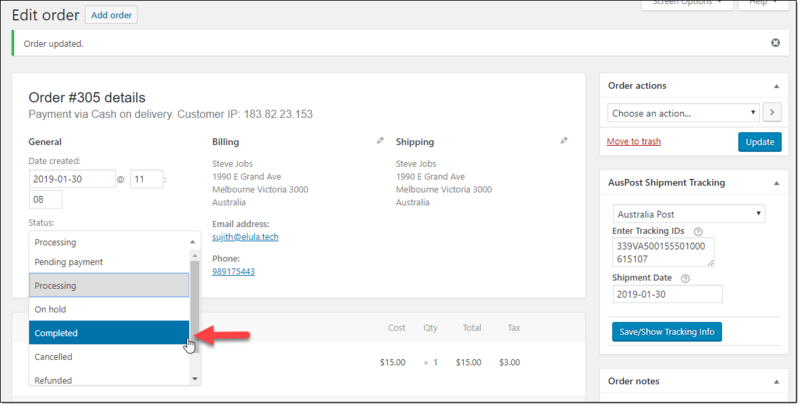 Your customers will be able to view the tracking code on their My Account section as well. If you configure order completion emails on your store, the tracking code will be included in the order completion that is sent to customers. When you change the order status to ‘Completed’, the tracking code will be reaching the inbox of the customers as well. The order completion email that the customer receives will also have the tracking information added in it. How Australia Post tracking helps? Being aware of the status of your shipment at all times brings a lot of peace of mind to your fulfillment efforts. When you ship through Australia Post, each item in your order will be scanned and a barcode will be attached to it. This will enable end to end tracking of the item during transit. they approve the shipping information you have provided. another notification will be initiated when the item arrives at their facility. the item is delivered to the customer. You can also login to the online tracking tool if you have an eParcel account with Australia Post. For this, you will have to contact an account representative of Australia Post. Australia Post also facilitates you to provide tracking notifications to your customers as well. You can include notifications for customers by providing their email id and mobile number in the delivery manifest. In this scenario, customers will be able to even manage their delivery options. If you are using a StarTrack account, you will get all the above tracking and notification features along with an option to handle cases where the delivery is missed. Missed Delivery – In case of a delivery attempt is missed, you can use one of the following methods to reduce the hassles. You can choose to redeliver the package to the same address. There is an option to request the delivery person to leave the package in the same address. Or, you can choose to redirect it to a different address convenient for the customer. And, if the customer prefers to collect the package from a Star Track depot, there is an option for that too. 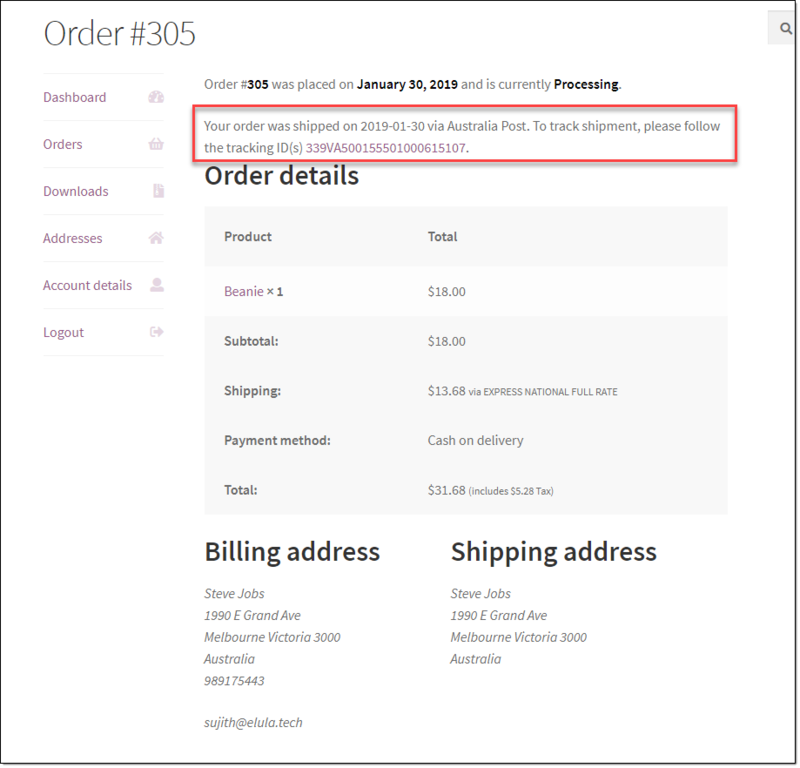 The plugin helps you integrate Australia Post to your WooCommerce store. Here is a quick look at some of the features of the plugin. Helps display Australia Post shipping services and their real time rates on your cart and checkout pages. Please note, if you have a contract account with Australia Post, the plugin will be able to display only contracted rates. For contracted rates, the plugin uses eParcel service, which is a great option for businesses that sell more than 1000 parcels a month. You will be able to display both international and domestic services with eParcel. If you are only focusing on domestic services, StarTrack services would be more suitable for you. You can print shipping labels of both eParcel and StarTrack depending on the service that you use. The plugin also offers a paid add-on, which will help you generate multiple shipments and print them in a single PDF file. The postage for these labels will be automatically paid using your Australia Post account. The international shipping document that you print using your eParcel account will have four labels. Please note, you can print labels using the plugin only if you have a contract account with Australia Post. The plugin provides an option to generate order manifest as well. 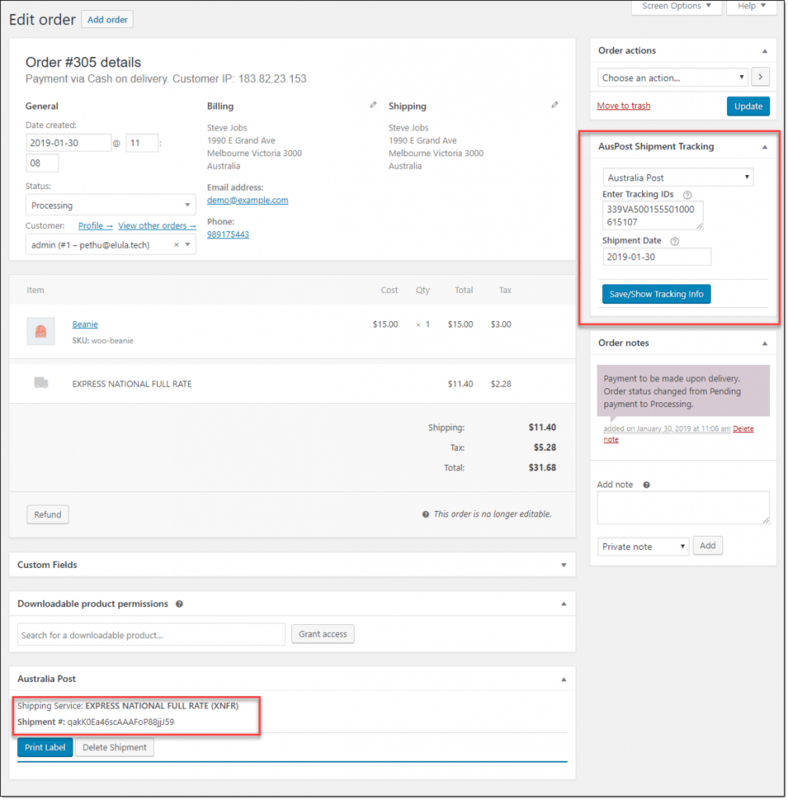 You will be able to generate an order manifest at the end of the day including multiple orders. You will be able to provide delivery notifications to customers by including their email id and mobile number in the eParcel delivery manifests that you create. Pack items individually – Each item in an order will be packed individually. Pack into boxes with weight and dimensions. Here you can define different box dimensions and weight limits based on the weight and dimensions of your products. Based on the items in an order, the plugin will automatically assign the correct box for packing. Weight based packing – Here the items will be packed based on the total weight of the order. You will be able to specify a maximum weight for the package as well. Offering shipment tracking is one of the basic aspects of providing a hassle free customer experience. Your customers will be encouraged to purchase more from your store, if you are able to provide a consistent delivery experience to them. In addition, you will be able to get better visibility on the operational aspects of your fulfillment process. Any flaws in the process can thus be rectified in a timely manner. More importantly, you can optimize the shipping experience with multiple carriers based on the products shipped and areas covered. You can learn more details about the plugin from the documentation page, or you can checkout the live demo.